Halloween is the perfect time to great really creative in the kitchen. 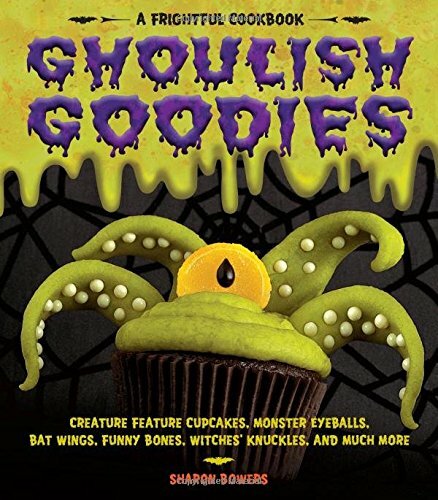 One of my favorite Halloween cookbooks is Ghoulish Goodies because it is chock full of fabulously frightful Halloween recipes and decorating ideas. 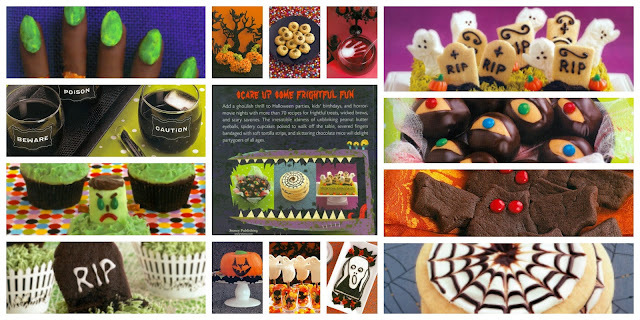 From spooky yet cute, to ghoulishly grotesque, there is something for every Halloween party or gathering featured in the cookbook. The front cover of the cookbook gives a very accurate description of what you can expect to find within the book. However, there is so much more than just what you see there. The back cover gives you a bit more insight, but honestly, until you look inside the book, you will not appreciate how truly fantastic this cookbook really is for Halloween. Let me show you some of my favorite recipes in the book. Keep in mind, there are a lot more in the book though. The features in the collage below just happen to be my personal choices. Paperback or Kindle Version Available!Check PriceThis really is a fantastic Halloween cookbook and one that every Halloween hostess should own. Each recipe gives the exact ingredients required, along with easy to follow instructions for creating these Halloween fun food masterpieces. It also includes lots of decorating tips alongside the individual recipes. For instance, it tells you exactly how to make the "super grass" used on the Ghost Graveyard cake (upper right corner of the collage above). There are extra recipes included for dipping sauces, plus tips for decorative tray presentation. 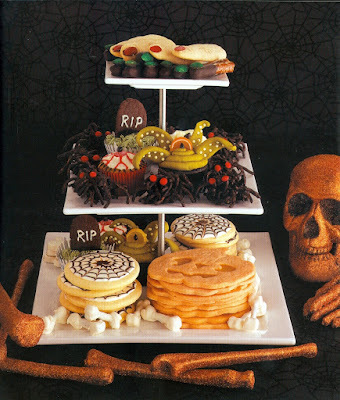 The presentation suggestions could easily be incorporated with other Halloween food. Believe it or not, the author didn't stop there. She has also included a section for Halloween supper. Some of dinner recipes feature Candy Corn Pizza, Orange Rice, or Ghost Mashed Potatoes. This would be a really fun supper to serve. Although I must admit, the meatloaf with an unblinking eyeball might me just a little too grotesque for even this Halloween Hostess. Do I sound excited to review this book? You bet I am! 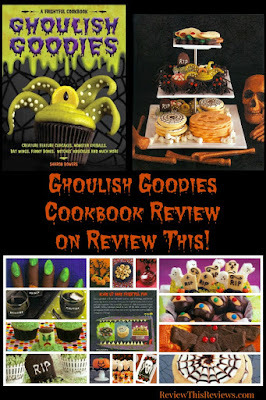 But, I am more excited about getting into the kitchen and making my own Ghoulish Goodies from this cookbook. Such delicious fun. The perfect cookbook for this time of year (or any time you are feeling a little ghoulish). 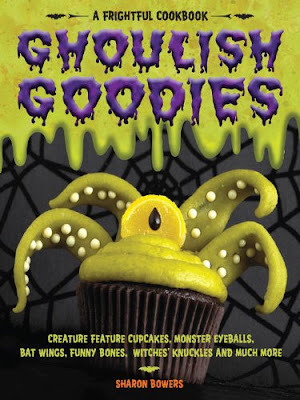 Oh what a great title for a Halloween cookbook, Ghoulish Goodies! I love to decorate food for the holidays so this sounds like lots of fun! Love it too! One place to get all those things that you need to make a Halloween Party stand out. So much fun all in one place! Thanks for a great review Miss Mouse! I think I need to get this book......be scary, be very very scary! Oh what fun! I'm thinking this would be a fun cookbook to have when the grandchildren come for a visit before Halloween...how they would love creating Ghoulish Goodies in Grandma's kitchen! I can only imagine how much fun my kids would have had making some of these. I'm sure they would have been a big hit at our Halloween parties back when we used to have them. I was never very artistic, but Sarah and Jason both got the gene from their Dad. He wasn't much of a dad (which was why we were able to adopt his children) but he was an artist. This sounds like the kind of cookbook I love! One of these Halloweens I'll get off my tush and make Halloween cookies - The books look very inviting indeed. You've really sold me on this book as well - I'll have to keep it on my gift list of ideas. Thanks for heads up on it.